Titinne was born in August 1988, her current owner is Murielle Nicolas. 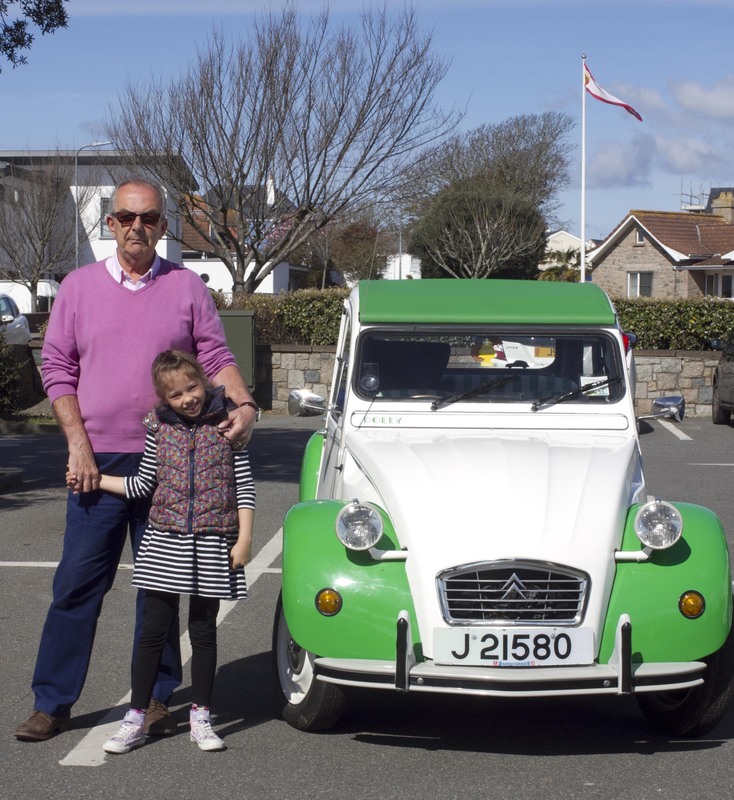 Titinne arrived in Jersey in July 2014 after Murielle had spotted her on a 2nd hand car dealership website in Eastbourne. A few phone calls later, a visit to the insurance company, plane and train ride and Titinne had changed owners. 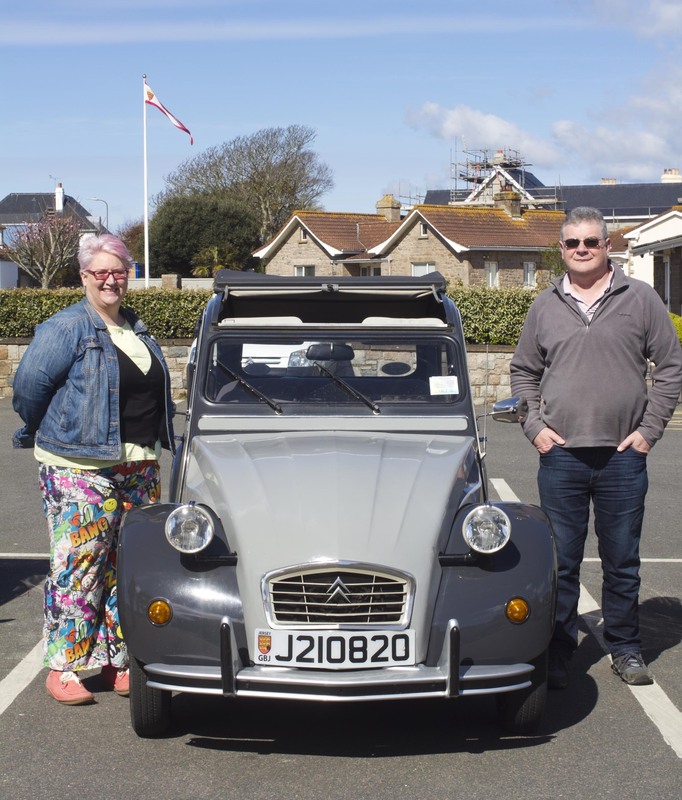 Titinne can be temperamental and has had a few adventures since arriving in Jersey, you can follow the adventures of this clever little car on her blog. 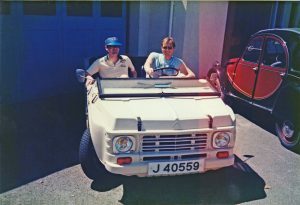 Noddy is a 1971 Mehari which Eddie bought as a 50th birthday present to himself, his”sports car convertible” mid life crisis car. 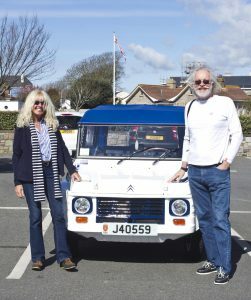 Noddy was named by Eddie’s wife, her good Swiss friend and her daughter after they doctored the number plate to read Noddy within a day of Eddie collecting him and driving him back to the Island. Noddy was brought via eBay from a lovely retired chap in Crediton, near Exeter, two years ago (2013), he was only selling it because he wanted a classic motor bike before was too old to ride one and his wife only let him have one toy at a time. 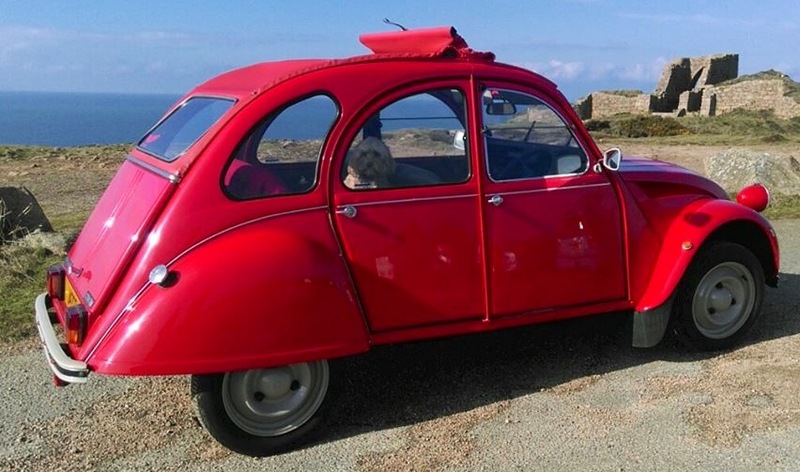 He had brought the car in the south of France where they lived at the time, had it transported to Calais and drove it to Crediton in the rain from there. 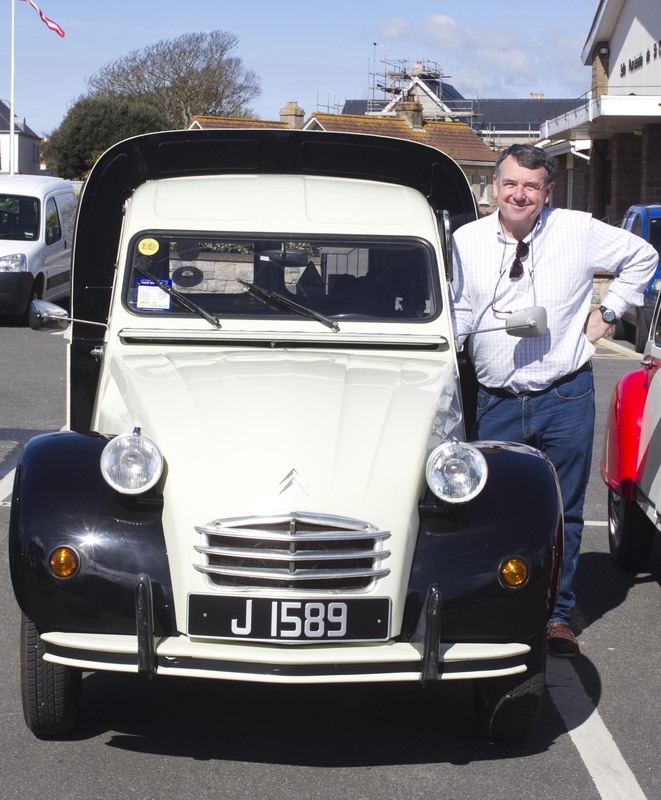 It has been back to France since, just the once, when Noddy formed part of a three car trip from Jersey to 2015 2CV Rally in La Rochelle in May of this year. Flat out on the autoroute we touched 80KPH (55 MPH) which was more than enough to keep me well chilled and in need of regular hot coffee stops to defrost. At La Rochelle Eddie brought his wife a little present, a Mehari mug which said “I love you almost as much as my Mehari“……..and got away with it! 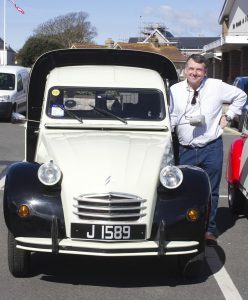 Eddie can truly say that Noddy puts a smile on his face every time he drives him, he is perfect for tootling around Jersey, great great fun. 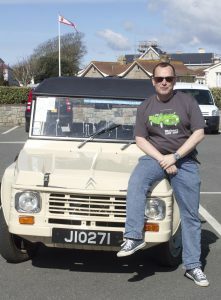 Camille is an AK 400 Fourgonette, her chassis number o matches that of a production run for post office vans in Belgium. These were red and there are traces of red beneath the current colour of the car. The bike rack was removed and has been filled. Sean tells us that Camille was a barn find, and that her previous owner who used to be a Rolls Royce panel beater had bought her as a retirement project. 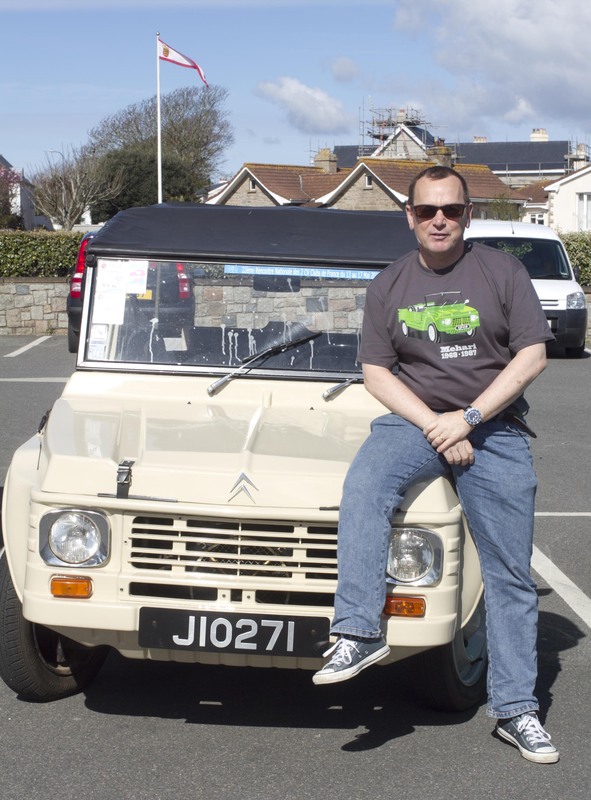 When Sean bought the car, it was in wales and had a superb body but only 1 drum brake working and a weak engine. 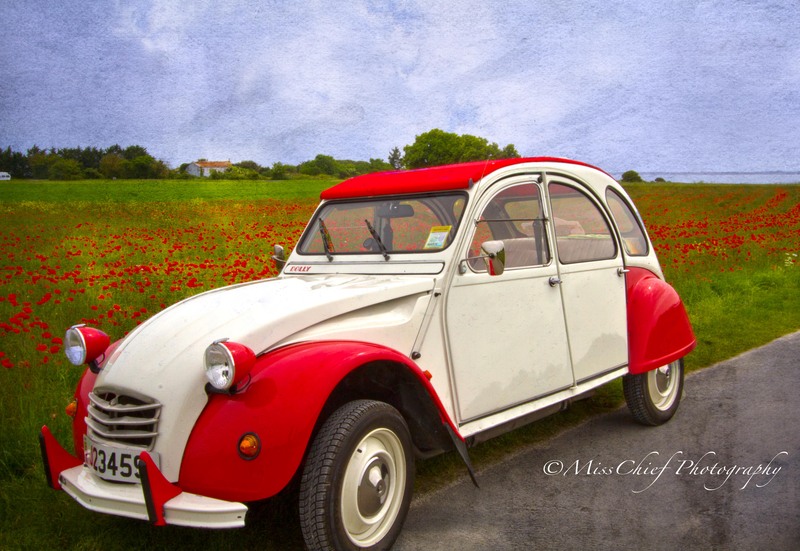 He nursed Camille back to Poole, some motorway driving and had a few hell raising moments at roundabouts. 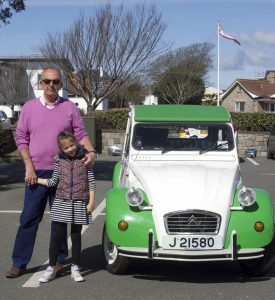 Camille now has a better engine and gearbox and disc brakes and is happily “en retraite” in Jersey. She is a 2cv Special, build in 1990 in Portugal and was purchased locally by Chris around 2007. 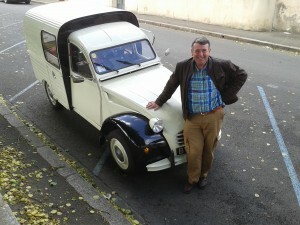 Chris has owned a couple of 2CV’s twenty years ago. That was in the day of £100 purchases that were driven with no maintenance and handed on to the next poverty struck friend. 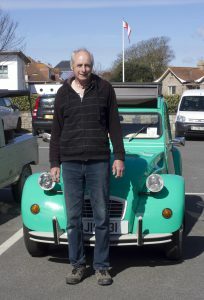 As a result of a nostalgic desire in 2007 (& wishing to tinker on something) he purchased another 2cv and has never looked back. In this day of modern cars that cocoon & cosset you from any real driving experience his 2cv has proved a real delight. It is rare these days that you listen to the sounds & feedback of a car while driving & at the end of the journey walk away with a grin and admiration for the ‘underdog’ on todays roads. The real test was when his then three year old son (now 11) preferred to go in ‘Dad’s cool car’..than his wife’s vehicle. Additionally, it was a great laugh recently when he and his wife received a round of applause on the Rennes ring road in Brittany from French drivers as he overtook traffic in the outer lane. The 2cv is called ‘Little Mule’ as she is very stubborn and perseveres even when she had pushrod problems returning from the middle of France. They had many adventures with Little Mule, including camping at a world meet in Salbris. Scarlet belongs to Helen. Helen’s love affair with 2CVs started in the 80s when she purchased a lovely yellow and black Charleston. She was Helen’s main car to drive and was driven and loved for several years. 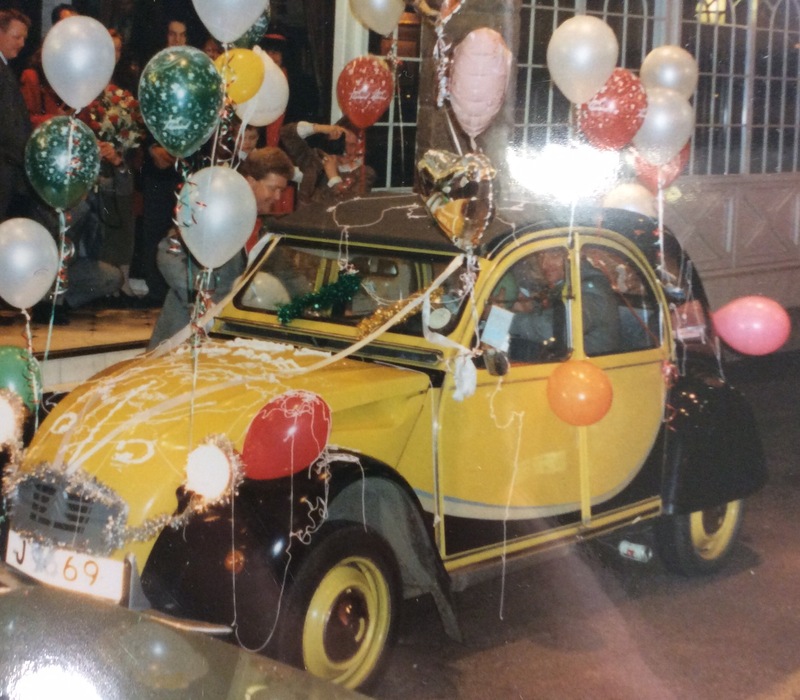 She featured as a main attraction at Helen’s wedding in December 1991 but Helen was forced to sell her a couple of years later – mainly because she would never start in the rain and Ben wasn’t happy towing Helen around the lanes in St Mary to set her on her way to start an early shift at work! 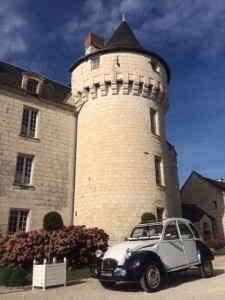 However, Helen always felt nostalgic whenever she heard a 2 CV approaching and, knowing this, (and unbeknownst to her) Ben set about finding another one for a surprise for her 50th birthday. It took him a while to find the right one – in fact it arrived as a complete surprise for her 52nd birthday! “Scarlet” is from South Wales, aptly named by Helen’s brother-in-law who found her, not only because of her stunning colour, but because he supports the Scarletts (Llanelli) rugby team. Scarlett is 1985, resprayed but original colour, fixtures and fittings. 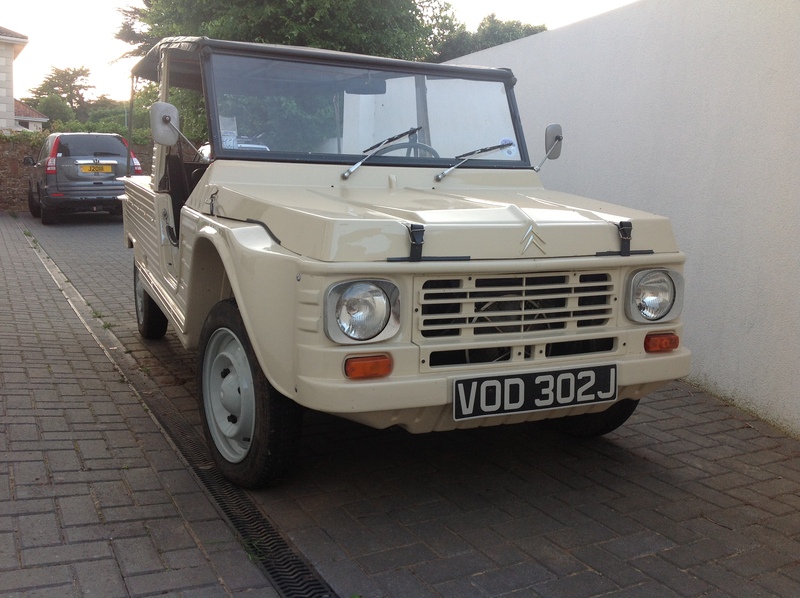 She is a little luxury, kept garaged and only likes to come out when the sun is shining. Millie (the club mascot) enjoys the outings as much as Ben & Helen! Scarlett has already featured at Helen’s friend’s wonderful wedding at Gorey Castle – along with Titinne and Philip Jeune’s Charleston. 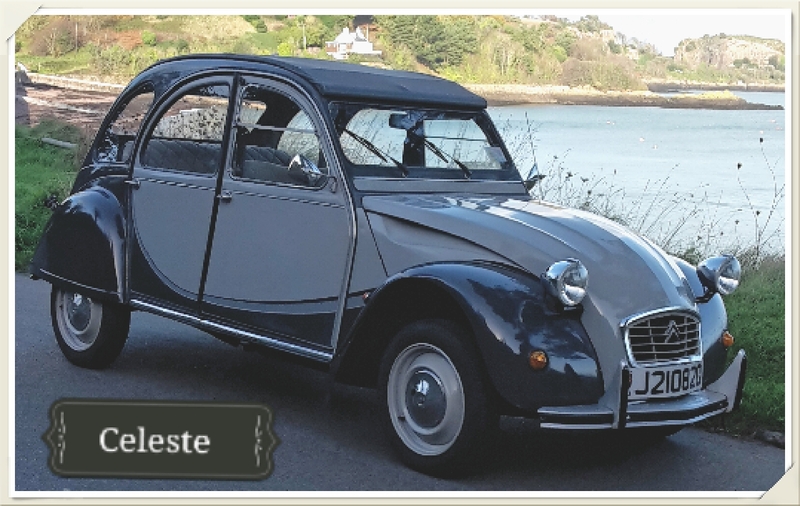 Celeste is a 1986 two tone grey Charleston and belongs to Jo. After getting a lump sum pay out on her pension Jo thought what better way to spend it than on a beautiful tin snail. She learned to drive in her mum’s bright turquoise one with black stripes and was keen to relive those memories. So having scanned the rock with no luck it seemed Jo needed to widen her search further afield. A quick email to her dad in the UK the quest was set. His challenge to find Jo her dream car! Within a couple of hours he had located a number of possibles. He rang the then owner of Celeste who explained someone was due to come and see her but he wasn’t convinced he would turn up. Thankfully he didn’t so Jo’s dad whizzed down to Christchurch in Dorset to check her out. Half an hour later the deal was done! The guy said he was pleased as he didn’t think he would have sold her to be bloke that didn’t turn up as he didn’t like the sound of him. 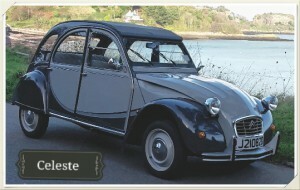 Celeste was named by the lady who bought her brand new in Devon. Named after an elephant in Babar due to her colouring. On purchase this was one thing the guy asked that Jo keep her name. A classic car enthusiast and racer he admitted his fondness for this little car and was over the moon that she was coming over to Jersey to a loving family that would look after her and enjoy her on our beautiful island. Jo is Celeste’s third (and last hopefully) owner and the original owner kept every piece of paperwork she had including the original purchase document. Jo is loving driving her and the smells and sounds are exactly as she remembers. Do all 2CVs smell the same? Even Jo’s teenage sons think she is kind of ‘special’ like their mother! Emmy came to our first club run with a different owner, she is now the proud baby of Peter and Penny. 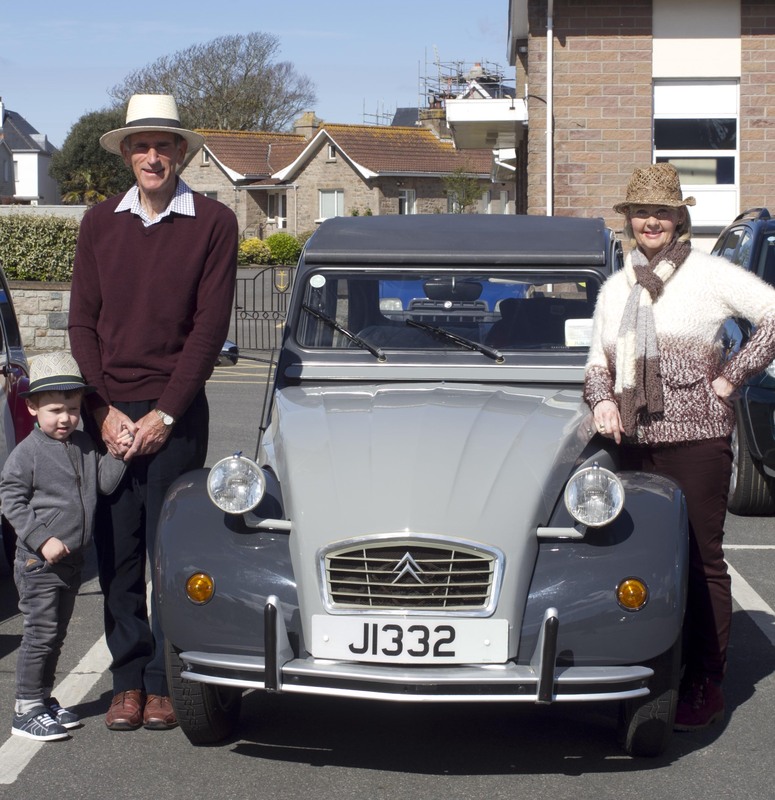 Not sure if Lynne has given her car a name there, but Lynne and Steven come and join us in their grey Charleston whenever they can! 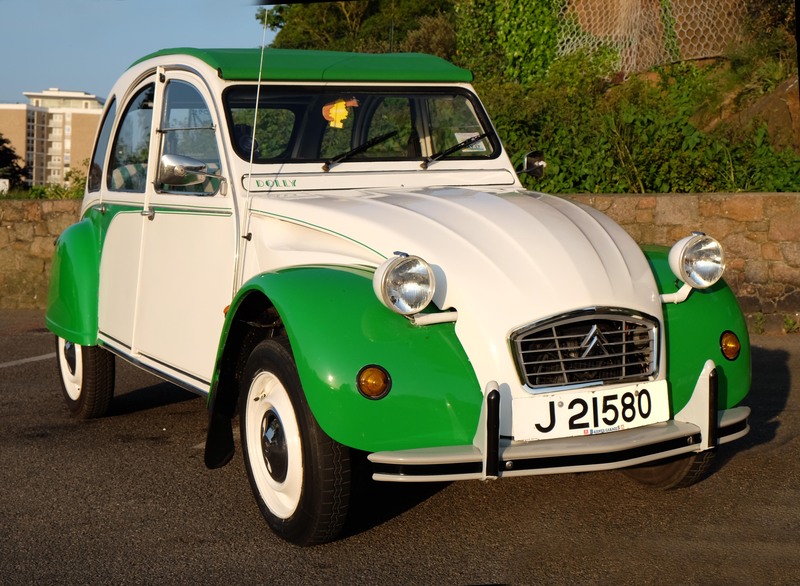 Their 2cv Dolly was bought from Barnes Garage New Street in 1989. It underwent light renovation when they bought it 2 years ago (2014). This dolly is used a lot so they don’t mind a few marks. The car has only done 29000 miles from new. It is very original and great fun to own. Their three grand children love her and call it the bumpy car for obvious reasons. And it never fails to deliver lots of smiles as they drive by. It can do 0 to 60 in about 5 minutes with a good tail wind and a nippy 70mph flat out down hill.